Let me start by saying, I am not a golfer. I don’t particularly have the patience for the short game, but I do like going to a driving range and beating the _____ (fill in the blank) out of a ball. However, on a daily basis I get invited to play golf for outings, fundraisers and by potential clients. While I don’t play, and have found other avenues to spend a lot of time with potential clients and referrals sources (which will be written about on jaimiefield.com), golf can be an amazing way to do business. You have 3-5 hours of unfettered time with people who can become referral sources or prospective clients. Notice I say “prospective clients”. This is because golf should not be considered the place where deals are made – sometimes they are, but more often than not, it’s about spending time with 3 other people in your foursome and getting to know more about them both personally and professionally. 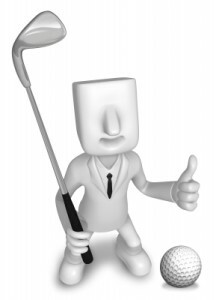 In law, where creating relationships matter for obtaining referrals, golf can be an extremely effective networking tool – even more so than going to networking events where you are meeting many people in one event and going from one person to another. Those 3 to 5 hours will allow you to create relationships. One of the major advantages of all of the time you spend on a golf course it getting to know the people in your foursome. Remember, “people do business with people they know, like and trust.” You don’t have to pitch them while on the golf course – you have to use this time to start creating the relationship which will lead to more business. So I say, if you are a golfer – go play! Bring one or two people who you don’t know well but with whom you would like to do business. It’s a great way to get out of the office too! P.S. That niche you would like to become well known in probably is having some sort of golf outing this summer. Why not get set up in a foursome where you can learn all about that niche? You have hours to ask a lot of questions about how to break into that niche.